Today I went down to Southwest Harbor for a concert. The Southwest Harborites were also celebrating the annual Pink Flamingo festival (the lawn ornaments are considered native fauna) and the Coast Guard base was having an open house so it was a high time on the village main street. 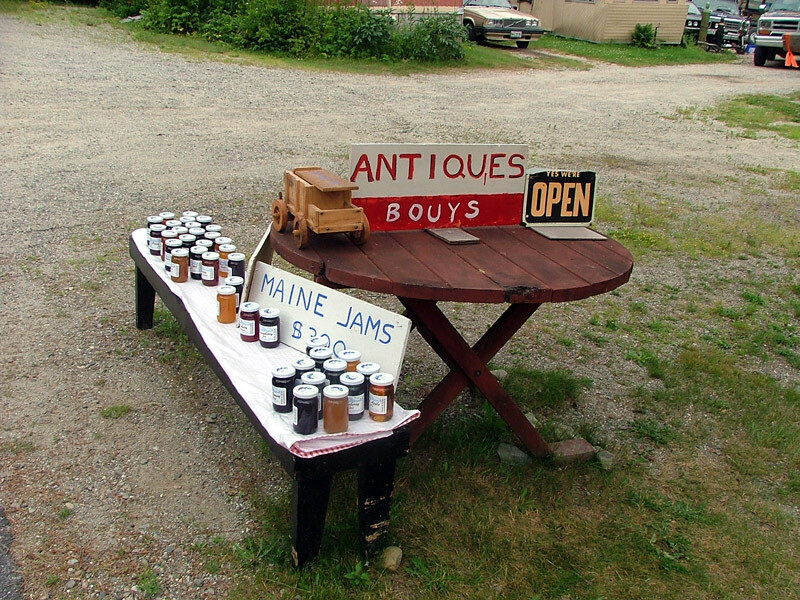 I took the back road down to Clark Point and stopped at this stand to buy a jar of pear jam. The sign is quite well designed, with the whole positive/negative space thing going on, and “Antiques” is spelled correctly. What happened to “bouys”? Curse those pesky diphthongs! I bought a jar of pear jam. I’ve tried to make it myself, and could possibly make gallons of the stuff from the Seckel pear tree’s bounty, but my trial batches were gritty and insipid. This jar from Maine’s Own Treats has a nice clear color. The contents list includes: Pears, Sugar, Applesauce, Apple Juice and Pectin. Applesauce sounds like it might be the secret ingredient. We’re going to try the jam out tomorrow on Sunday waffles and then I’ll decide if this combination is worth another experiment. I like the “We’re Open” sign, too. There wasn’t a soul around – what changes when they’re closed? This entry was posted in condiment, horticulture, orchard, recipe and tagged garden, harvest, kitchen, neighbors, orchard fruit, summer on July 10, 2010 by APo.